With more and more supermarkets coming to Phnom Penh, we’ve updated this post (again) to add a few more! Despite Cambodia’s status as a developing country, its grocery stores are, compared to many neighboring countries, fantastic. 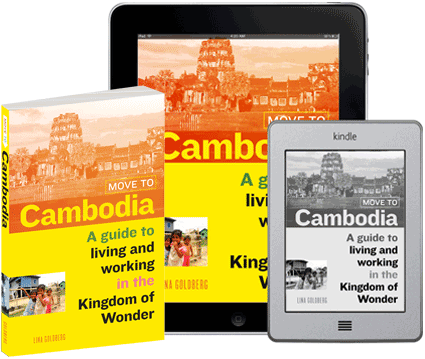 Because Cambodia signed up to the World Trade Organization in 2004, the country was flooded with imported goods–maybe not so great for the economy, but the expats in town aren’t complaining! Phnom Penh’s supermarkets aren’t cheaper, of course, than shopping at a local market, but if you prefer your meats refrigerated, your prices fixed and access to imported products, you’ve got many options in Phnom Penh, and more are being added all of the time including organic options. 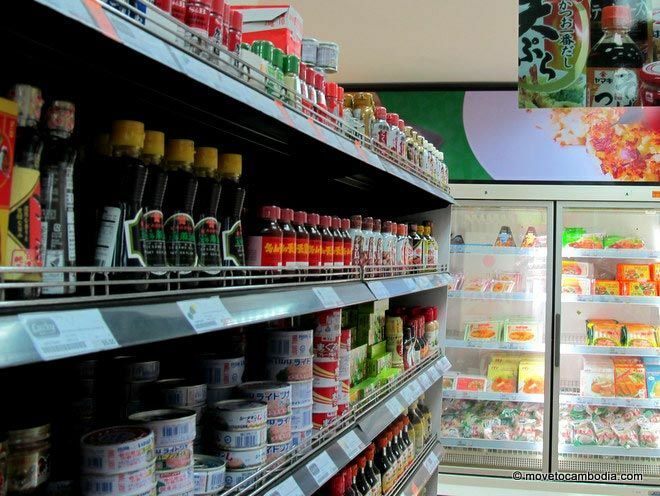 This updated posts features the ten best supermarkets in Phnom Penh. Get lucky at Lucky Supermarket’s most popular outlet in Phnom Penh. Lucky is a chain of Western-style grocery stores in Phnom Penh (ten? at last count). In this post, we used to recommend specific Lucky outlets, because they carried a different selection of various products. These days, the stock is more streamlined so we’ve combined their listings into one. 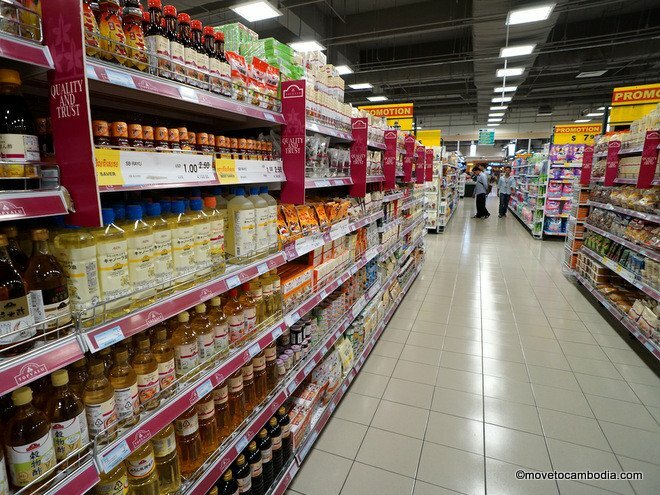 Lucky Supermarkets have a massive selection of foreign foods, including imported meats, fruits and cheeses, including specialty items including Greek yogurt and chorizo. Their selection of vegetables and produce is outstanding, although the prices have been steadily climbing so if you’re watching your wallet, it makes sense to buy the locally available items at a local market for half the cost. Lucky also carries a large selection of Western and Asian snack foods as well as dry goods like shampoo and diapers. The Sihanouk branch is one of the most popular, but gets crowded after work so plan accordingly. The Lucky City Mall branch has wide aisles that make it easy to navigate a cart or stroller in. The newish Toul Kork Lucky is fantastic if you happen to live in the area. Open Monday to Thursday 8 a.m. to 9 p.m. and Friday to Sunday 8 a.m. to 10 p.m.
Aeon Supermarket offers an amazing grocery experience, if you’re willing to brave entering the mall. The Aeon supermarket at Aeon Mall is the flashiest grocery store in town. It seamlessly melds an array of imported products with traditional Cambodian foods. The pantry and dry goods section has a wide selection of international items, while the fresh foods department carries everything from silk worms to prahok. They’ve also got an amazing food court, with a huge selection of Cambodian dishes, sushi and more. The downside is you have to go to the mall, which means parking or dealing with exorbitantly priced tuk tuks. But if you’re already there, be sure to check out their groceries. If you want to stock your pantry, Bayon Market in Phnom Penh offers the widest array of dry goods at the lowest prices. From American cereals to Korean ingredients, Bayon has brands from around the world, including some surprising finds, like Costco-brand olive oil and vitamins. Bayon carries a few key items that you won’t find elsewhere in town, like canned and dried black beans and chick peas, as well as various other legumes. They do have a small meat and vegetable section, and although their veggies can be much pricier than at local markets, they often carry items that you won’t find locally. They also have a good selection of beer, spirits and wine at reasonable prices. Upstairs they have one of the most complete kitchen supply stores in town, where, oddly, you’ll find items from Ikea and Walmart. If you’re looking for French cheese, pate and foie gras, look no further than Thai Hout. Thai Huot used to be small, but after a recent renovation they’ve expanded to be almost twice the former size, still filled with a wide array of foreign products, with the focus on French and European goods. 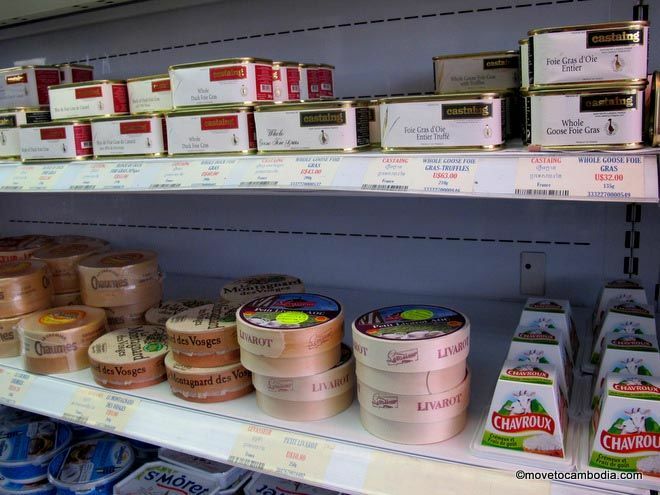 They are known for having one of the best selections of cheese in town, as well as pate, foie gras and all things tempting and French, including lentils, tinned cassoulet and duck confit. Obviously, you’ll need a few baguettes to go with all of the above, so of course they have good, reasonably priced bread as well. Their vegetable selection is small, but they have the essentials. Where Thai Huot really excel is in the spice department–they carry many spices sought by Europeans that you can’t find anywhere else in town, such as herbes de provence. Thai Huot in BKK 1 has all of the amenities of the original, and a more convenient location for many. A new Thai Huot supermarket opened last December and it’s possibly even better than the original, and with it’s BKK1 location, certainly more convenient for many expats. Thai Huot excels in dry goods, dairy, and cupboard items. They’ve got a great selection of French wines and cheeses, and French baked goods, plus an excellent array of European spices. They aren’t as impressive in the meats department, but all of that cheese, glorious cheese, makes up for it. Thai Huot used to be one of the only places in town you could get a Camembert. Now there’s loads of competition, but unlike many of the once-unique businesses in Cambodia who struggle to keep up with the pace of development in Cambodia, Thai Huot has been able to stay ahead of the curve. The Providore is a new gourmet deli that offers a nice selection of French, Spanish, and Italian ingredients (much of it coming from AusKhmer), including hard-to-find items including smoked paprika from Spain, canned piquillo peppers, high-quality olive oil, saffron, and everything else you need for a tapas night. French ingredients aren’t as hard to find in Phnom Penh, but the Providore has more than its share of foie gras, duck terrines, and French pickles. But it’s the deli items that will really appeal to Phnom Penh foodies — they carry Italian-style Khmerita meats, Spanish charcuterie, preserved fish, and cheeses, and an excellent range of French terrines and soft cheeses. Frozen seafood and meats (including Wagyu beef) is also available, as is Cambodia Rumblefish coffee. If seeing the place makes you hungry, the Providore also has a small cafe with a menu that features their products. Phnom Penh’s first 24-hour grocery store! 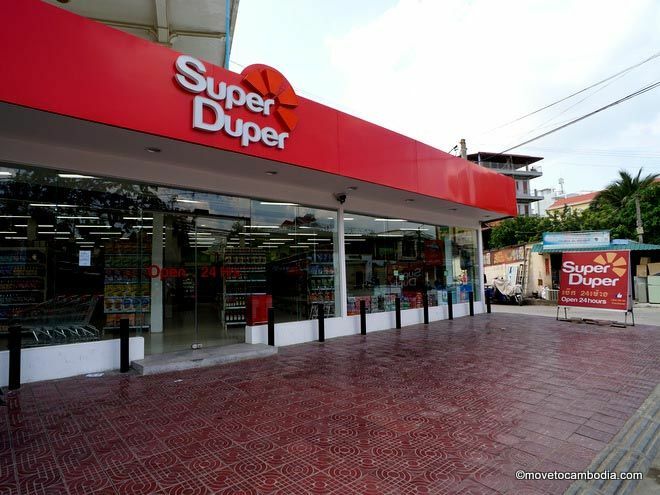 Super Duper is an excellent 24-hour grocery store with two outlets, one in Toul Tom Pong (bringing a much-needed shopping option to the area) and another new store on Sothearos Blvd. The store isn’t huge, but they stock a surprisingly interesting collection of all sorts of imported foods, plus a nice selection of things that you’d find in a grocery store back home but rarely in Cambodia, such as light bulbs, birthday candles, and batteries. 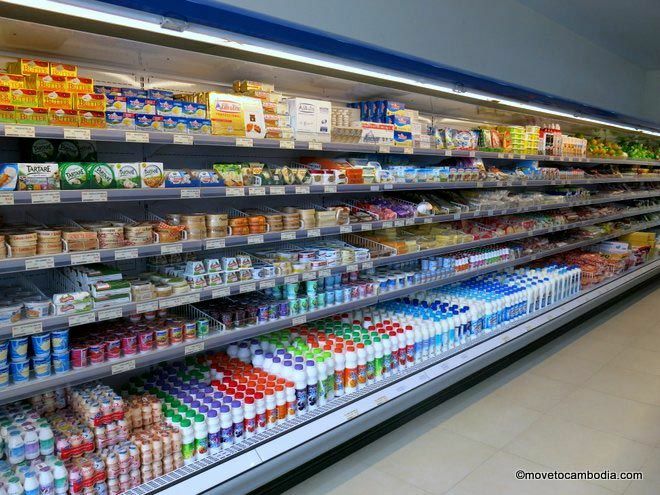 They also carry many refrigerated goods including vegetables, cheeses, and a surprising array of dips. If you’re looking for spices, House of Spice is the place to go. They have a wide selection of Indian, Asian, and Western spices. They’re the supplier for many of the other places in town so presumably their stock is fresher and less expensive. Open Monday to Saturday, 9 a.m. to 6 p.m.
It’s au natural at Natural Garden. Natural Garden is Phnom Penh’s leading source of organic vegetables for restaurants and hotels, but they also have a couple of retail locations. The Street 63 is their original store, and carries a wide range of organic vegetables, fruits, and herbs. They’ve got their own farm where they grow most of their produce, which actually looks organic, i.e. imperfect in a good way. Natural Garden is one of the only places in town where you can find proper red tomatoes. They also sell organic rice, free-range chicken, and eggs. Natural Garden also carries a range of imported meats and cheeses that while are not necessarily organic, are high-end and tasty. The store is also a good place to find other natural and organic local products that show up from time to time, from macrobiotic lunchboxes to locally-made yogurt drinks. There’s more! 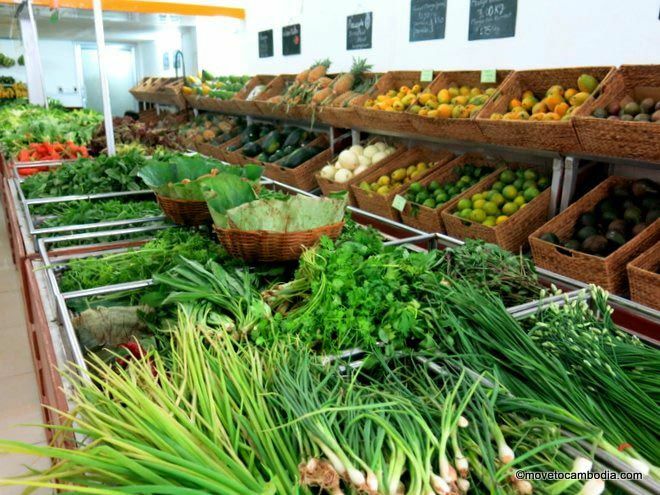 We’ve also got a list of all of the organic groceries and retailers in Phnom Penh. 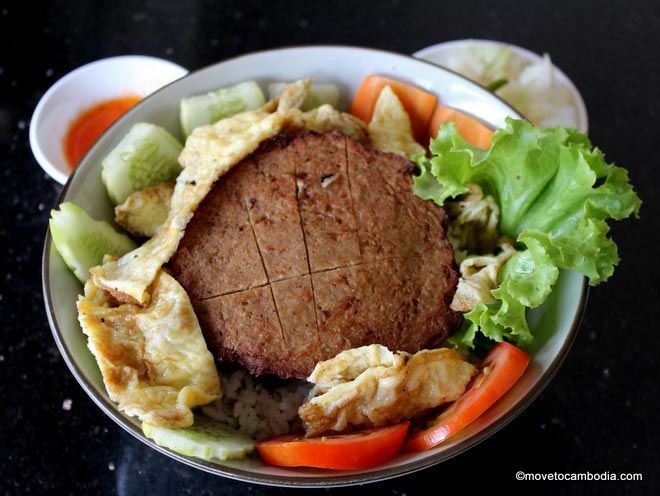 This entry was posted in Phnom Penh, Food and tagged Lucky Supermarket, Thai Huot, Bayon Market, Phnom Penh supermarkets, Phnom Penh groceries, Phnom Penh grocery stores, Aeon Mall, Natural Garden, Super Duper, House of Spice. Bookmark the permalink. Where is the best place to buy Karpov pepper and Vietnamese cinnamon? hello, do you know which supermarket close the latest ? thanks. Hi all, does anyone know of a supermarket that carries a good selection of Mexican goods ie chile peppers (dried or fresh NOT canned or jarred), masa harina to make corn tortillas etc etc? Thanks in advance! I have never seen dried or fresh Mexican chilies in Cambodia, but sometimes Bayon Market has masa.